Q. What is the difference between laser engraving and rotary engraving? Laser engraving is typically for fine type of work like a detailed logo. A carbide tip is used in general by older engravers that rotate rapidly to cut into an engraving rock – used for literally hundreds of years. More sophisticated laser equipment is used by us for an enhanced & detailed image. Through this technology, the text and logos are reproduced more accurately. 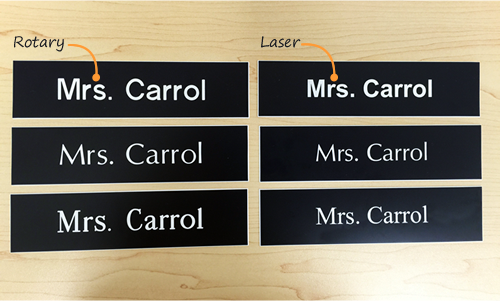 The new laser equipment even lets you engrave a photo, like on a name badge. As easer on the pocket, more and more signs are being produced through laser engravers as opposed to older rotary methods. It’s fast and powerful. Q. Do you charge extra for each letter that must be engraved? Our engraved sign pricing is straightforward. There's one price for each size; we do not charge extra for more text. Of course, many others charge a fee for each engraved letter. With our lightening fast laser engravers, this pricing model no longer makes much sense. Q. How small can the letters be for a Braille sign? Must we use CAPITAL letters? Letters and numerals shall be raised 1/32 in, upper case, sans serif or simple serif type and shall be accompanied with Grade 2 Braille. Raised characters shall be at least 5/8 in (16 mm) high, but no higher than 2 in (50 mm). Pictograms shall be accompanied by the equivalent verbal description placed directly below the pictogram. The border dimension of the pictogram shall be 6 in (152 mm) minimum in height. Q. I want to be able to change the signs around. The message changes, depending upon the day or service that we provide. What do you recommend? The lowest cost and simplest solution will be to use our wall brackets. These are suitable for the 2" x 10", 3" x 10" and 4" x 12" signs. For other sizes of engraved signs, choose the Velcro option. Q. I want my sign to be seen from the outside. But, I do not want the sign to be stolen. Do you have a solution? Consider ordering an engraved sign along with suction cups. That way, you can fasten the sign to the inside of a window. Also make sure to order your signs with holes at the top to attach suction cups. Q. Do I need to add Braille to my room signs? Is every sign covered? Please consult the Americans Disabilities Act (ADA) Signage guidelines. Permanent space signs in areas of Public Access require both tactile lettering and Grade 2 Braille. In practical terms, Room Numbers and Room Name signs are covered under this guideline. Permanent room signs must be mounted 60" from the floor to the center of the sign on the wall next to the latch side of the door. Directory signs, signs that tell you how to get around the building, or signs that give you information about permanent features of the building do not require Braille. These signs, however, must still comply with height, finish and contrast rules for lettering and background. These informational signs are not required to have raised letters or Braille. Not every sign is covered. As we all know, a typical school, hospital, factory, etc, has a maze of signs. Marketing or trade name signs are not covered. In practical terms, safety, industrial marking and notices are not made using tactile letters. General and informational signs are not required to have raised letters or Braille. The primary use, in practice, for tactile signs are found in offices and for permanent room installations. Q. Do you offer "back-engraved" signs"? What are the advantages to this style of engraving? Yes, we do. Some of our nameplates are back-engraved. Any of our signs can be ordered in this back engraved style. Just call us up and we can arrange to make your sign this way. There might be a small increase in the cost. Back-engraved signs, to many, look quite professional. The signs seem "polished". For others, back-engraved signs are easier to clean. Q. Can I use my own type font? We offer hundreds of fonts. To both simplify and speed up the engraved sign wizards, we just show a few of the common fonts. Yet, please do not hesitate to contact us if you want a special font. We are actually quite "font-crazed" here. We love fonts and know what a difference a font can make to the look of your sign. Q. Can I add a logo? You may add a logo to your sign – usually at a small cost. Also, make sure to look over our clip art and logo library. We already offer hundreds of logos and graphic images. Be aware, of course, that not all logos are well-suited to engraving. The logo needs to be clean, have sharp edges. Bit-mapped images are often tough. Remember that a laser or knife is actually cutting into the plastic material and a good deal of fine detail can be lost. We offer an upload wizard to help you transmit the logo to us. We will convert your logo, in most cases, to a single color. For certain, multi-colored signs, however, full-color logos are possible. Q. How many lines of text may I add to my sign? Do you charge extra for extra lines of text on the sign? We do not charge extra for more lines of text (unlike most others in this market). Frankly, it is rather rare that you see the "Gettysburg Address" on a sign. Our laser engravers make fast work of your text. This is the main advantage of our system. Your sign goes directly, and digitally, to our engravers. That saves time, reduces error and keeps costs low. The number of lines to be used on a sign is really an issue of legibility and not a problem with manufacturing. Adding too many lines means that the type must be smaller and each line harder to decipher. Consider, always, a larger sign if you find that your message becomes small. Our sign wizards use an innovative "shrink-to-fit" technology that can result in important messages become too small. Generally, engraved sign type should be no less than 10 point. There are special engraving stocks, actually, that are made for super-fine type. Over the last ten years, or so, engraving stock has changed so that the top layer is much thinner (now 5 mil). When compared to the earlier materials (which had a thicker 10-15 mil top layer), the new materials allow for finer engraving and smaller letters on your sign. Please give us a call if you want to learn more. Q. I want the engraved sign to be seen from across the hall. How big should the sign and the letters be? Our "rule-of-thumb" is that each inch of letter height can be seen from 50 feet away. The ANSI sign standard (see both ANSI Z535.2 and A117.1), however, is much more pessimistic. This is based on a ratio of 25 feet per inch of height for the sign message. Much depends upon the size of the building, the angle at which you approach the sign, the lighting and, even, the age and visual acuity of the viewer. An airport, parking garage or convention center needs larger letters than a sign used in a narrow hallway. Also, the headline should be larger – whereas the remaining explanatory text may be smaller. The top row leads you to the sign; once there, you can study the remaining text. In the sign market, sign legibility is increasingly a "hot button" as our population gets older. Signs read by older individuals need to be bigger and to have better lighting than those read by younger individuals. As vision deteriorates, the letters start to fill in and blur. Recently developed type fonts, however, are designed to have a highly legible lower case alphabet. The research finds that a high X value and letters with a 1:5.7 stroke width to height ratio. The X value of a font is the height of the lower case letter in proportion to the capital letter. Most sans serif type fonts have an x-height that varies from 73% to 75%. Helvetica has an 75% x-height. A serif font, such as Times, has only a 63% x-height. Researchers have found that your eyes scan across the x-heights of the letters when you read a word. Also see the question from the customer below. Q. Should I use all capital letters for my sign? Or, should I use upper and lower case letters? In most cases, we recommend caps or a bolder font for the headline. But, try to use umixed case letters for the rest of the sign. If the sign has a great deal of text, type your legend as it would be seen in a book or article. Too many capital letters becomes confusing. Note that we read phrases or groups of letters at a time. You read clumps of letters, together, as one shape. Reading individual letters in all capital letters, would slow us down and has been described as how an early child reader proceeds. ("It is like having your lips move when you read.") In a type font, the ascenders and descenders provide important clues. One of the reasons that we do not spot many typographical mistakes is that we do not read letter by letter. Our "expectations" of what is about to be said allows us to speed through the passage. See the sign below. It is not easy to spot the typo. You may use the capital letter height for readability guidance. The illustration below shows how much more readable the upper and lower case word is than the all caps version having the same "footprint." Both headlines have the same "footprint". Yet, the upper and lower case version is more readable than the all-caps version. The upper case alphabet has many more straight lines and is far simpler. A well-know typography expert once stated, "capital letters are for tombstones only!" Q. What is a "Wayfinding" sign? A Wayfinding sign is used to provide directions as you walk though a building. An airport, for example, is replete with wayfinding signs. For sign "insiders" a Wayfinding sign is generally seen as larger sign than a mere room number sign. Q. What engraved sign material is best outside? The metallic signs have terrific outdoor life. Many of the acrylic signs also offer good UV and weather resistance. Please call our customer service experts to get specific advice for your particular sign. If you want to use your sign outside, please note this on your order. We will substitute a material that is designed to be used outdoors. Q. Do all lines in the sign have to be the same height? No. In many signs, the first line (or headline) is often larger than the other lines of text. The extra height is used to get attention, or for emphasis. The viewer can then come closer to read the rest of the text. Q. What type of Braille do you use for your signs? We use the ADA compliant Grade II Braille. Unlike lower cost engraved signs that route out the Braille symbol (usually Grade I Braille), our ADA signs use the latest in polymer and bead technology to produce ADA compliant signs. Our method is a licensed patented process. The Braille produced is rounded and not flat. Q. How long does it take to get the signs? Most signs are shipped that same day or on the next day. Most signs are shipped via the post office. For central US locations near to our factory in Texas, USPS takes a 2-3 days. In other locations, the shipments take 3-5 days. For faster service, you may specify air shipment. Q. Can I order my engraved signs with rounded corners? Yes, you may request this as an option. Note that you want your engraved sign with rounded corners in the "Notes to the Printer" section upon checkout. 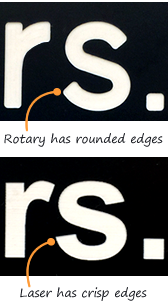 If your request rounded corners, however, we will not bevel the edges (unless you indicate this, as well, in your note).